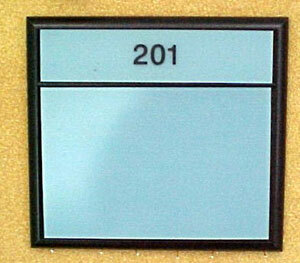 Lasers have now been used in the making of signage and similar products for over 20 years! In that time frame, many changes have occurred, but one thing remains constant: sign makers and other professionals are finding more and more reasons to use laser technology for providing quality products and services for their customers. There are many advantages to laser engraving over more conventional methods. Using a beam of light as a tool, engraving by laser produces a non-contact mark which results in less wear and tear on tooling and associated costs. There is also less chance for product damage and/or deformation. There are also no consumables and no problems disposing of toxic by-products, as there may be with some methods. While the original laser engraving systems were large, cumbersome, difficult to run and maintain, today's systems have evolved into machines that are simple to learn, operate, and take care of. The earlier systems also had more safety issues than today's systems and required the constant replenishment of gasses. Today's equipment has evolved greatly from those early days. The lasers are now sealed and a constant flow of gas is unnecessary. The latest equipment also provides faster engraving speeds and features more options. Most service is performed via e-mail, fax, and phone with parts being exchanged, as necessary. Prices have also dropped making it feasible for more people. But the most significant change of all has probably been the interface of laser engraving equipment with computer technology. The engraving system is connected to a computer via a parallel printer cable. A machine driver, provided with the machine, is installed into the PC. The process is much like adding a printer to your computer. Artwork is generated on the PC in a graphics program much like CorelDRAW (other products are used as well) or artwork is scanned in via a scanner, and then cleaned up as necessary. 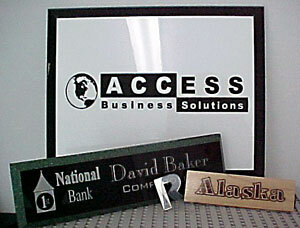 The manufacturer can assist you with selecting a computer that is best compatible with your laser engraving system. Keep in mind however that greater computer capabilities will result in greater engraving capabilities. You will quickly learn that laser engraving is very much a computer function. The best engravers we know are excellent graphic artists. Laser Technology, while it has come down dramatically in price since it's inception, is still an expensive technology. There are also limitations in much of the equipment as far as size capabilities. Additionally, a laser still cannot compete with a router when it comes to removing large areas of artwork. And like other machine tool methods, lasers also have specific safety issues that should be addressed. Because a laser is a beam of light and also defined as capable of emitting radiation by the CDRH (Center for Radiological Health), lasers do bring up certain safety issues. Both the manufacturer and the user are required by law to comply with certain regulations. Manufacturers are required to build safe equipment and affix warning labels to the machine. Users need to be aware of the hazards and use the machine accordingly. There are also fire hazards that need to be heeded. Additionally, high voltages of electricity are present in the system’s electronics that operators and maintenance persons should be aware of and take the necessary precautions. To ensure clean air for laser users, visitors, and neighbors, a good working exhaust system is also essential to remove vaporized materials from the facility. Additionally, some materials, when laser processed, have potential health risks, so it is important to always know what you are laser engraving. It pays to always use caution and follow the original equipment manufacturers recommendations to ensure a safe operating environment. To find out more about laser technology, start with industry trade journals or online articles. Industry directories will put you in touch with current manufacturers of new equipment. The factory and their distributors can assist you with questions you may have about the technology and in deciding if lasers could help your business. If possible, ask for a demonstration on your product(s). This will give you the best sense of what the equipment might be able to do for you. Prior to any purchase, you will want to also find about warranty and service issues. Today’s laser engraving equipment is easy to learn, run and maintain. It is also more affordable than in past years and has greater options, speed and versatility. To learn more about today’s laser technology, contact the manufacturers of new equipment. They can be found in trade journals, at trade shows, and listed in industry directories. Additional information can be found through online searches. This informative article is provided by Diane Bosworth. Diane Bosworth, long recognized as an expert in the field of laser engraving, currently, with her husband, Rob, owns and operates Access Business Solutions, Inc., the headquarters for quality used laser engraving and marking equipment. (CO2 and YAG).